4. Jodi Special Idea Users 25th May 2014 to 27th May 2014.
b. In case of error in SMS format, the response message will read on the lines of “Invalid format.SMS KBC<A/B/C/D><M/F> to 5252525.TnCs on KBCSony.com.Upto Rs6/SMS.Download the FREE KBC Official App-tinyurl.com/KBCApp”. 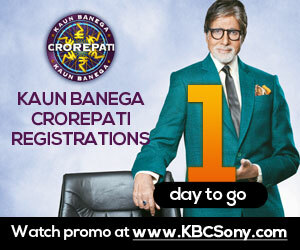 c. The acknowledgement message for entries sent in the prescribed format will read on the lines of as “ Thanks for registration.If selected KBC SONY Team will contact you in 5 days.